Are best spent on your favourite chair, ignoring the pupparazzi. 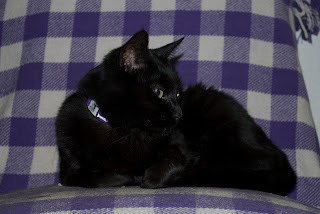 The purple blanket matches my collar nicely, don't you think? My grandparents came to visit last night. They did not bring me any new mouses. I don't know what is wrong with them. No, I don't have any idea what I was doing. No, I probably couldn't get into this position again. The other night I was minding my own business, having a snooze on the couch, when the pupparazzi got in my face. I told them to talk to the paw. 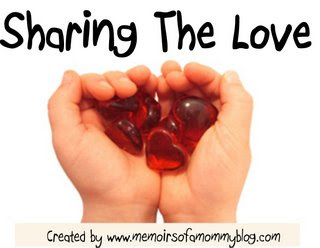 This lovely award is created by Crystal at Memoirs of a Mommy in honor of Noah and the donor of his sweet little heart who ENCOURAGES us to SHARE THE LOVE! Thanks Crystal! The rules for this award are to pass it along to some people whose blogs you love. They make you laugh, smile, leave encouraging comments on your blog. You would like to share some love with them because they have uplifted, inspired, encouraged or prayed for you. Please include this paragraph with the link to Memoirs of a Mommy so that everyone knows from where this award originated. My very cool friends the Army of Four have passed on this award to their blog readers and that includes me! Thankyou so much Storms, Ammy, Dave and my best friend Zimmie! 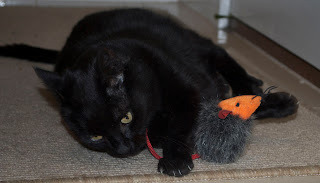 Just hanging out with Mr Mouse. You've probably all seen how my best friend Zimmie's older sister (and alpha dog of the house) Stormy sleeps with both her front paws in the air. Their mum calls it the Stormy Salute. Here's the Huffle Mawson version. I hope Stormy thinks it's good. 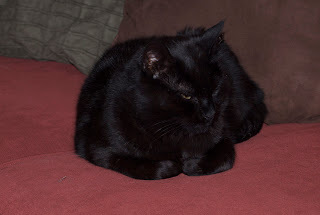 I forgot to say yesterday in my vet report that the vet said I am in very good health for a nearly-nine-years-old kitty. I wouldn't need to go and see him again for at least five years, will I? On Saturday night, mum and dad went to visit Charlie and Opy's mum and dad. They didn't get home until 12.30am on Sunday morning so they must have had a good time. But most importantly, Charlie and Opy and their mum and dad sent me a Christmas present! I got some new mouses, including a fish mouse, and a Christmas card. You can't see it though, some of you are getting cards from Charlie and Opy if you are in the Dogs with Blogs Christmas Card exchange so I don't want to spoil your surprise. I also got a bag of treats! They are Huffle-sized chicken and fish sandwiches! They are so very tasty, and now I don't feel so bad that my mum can't find Temptations for me. Thanks Charlie and Opy, and your mum and dad! Somebody call the RSPCA. I have been abused and tortured. Yesterday, mum and dad took poo-face Salvador and I to the v-e-t. The following pictures are pretty graphic, pups and kitties. Be warned! This is Salvador and I in our crates. We did not want to get in them and fought and scratched the whole way. Salvador would not look at mum. After dad put us in the car to drive to the vet, I cried the whole way. Before we'd even driven out of our street I had peed in my crate. Mum and dad were not happy but I wasn't finished yet! A few minutes later I pooped in my crate too! We had to drive with the windows open (even though it was raining) because of the smell. I was pretty happy with myself. Unfortunately, I forgot that dad would clean me up when we arrived at the vet. I had to have a BATH! Ammy, I cried like you did the whole time. I was so unhappy. I tried my best to jump off the table but the vet nurse lady had a good hold on my neck. What mum and dad didn't realise until we got to the vet was that Salvador had pooped in his crate out of sympathy with me. He had to have a bath too but nobody got a photo of that. He hasn't forgiven mum and dad yet. Me either. You will not believe what mum and dad are doing to me today. First, they're making me go to the v-e-t. That's not what I want to do with my weekend. Then, they're going to visit Charlie and Opy's mum and dad! But they're not taking me with them! I don't think that's very fair at all. I'll be sulking on the bed this afternoon. Tomorrow, if I feel up to it, I might tell you about my vet visit. My mum has a sick paw. It's called RSI - Repetitive Strain Injury. She says she got it from spending too much time in front of her computer at work, and at home. 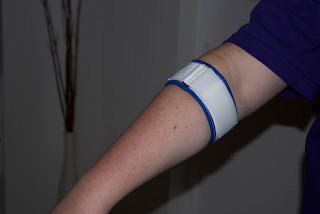 This is the special bandage she has to wear to help her elbow. Now look - I've got the same injury - RSI - Repetitive Sleep Injury! 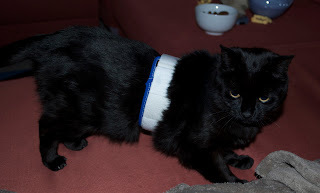 I have to wear a bandage too, to help me sleep. Those who are tagged need to write their own blog about their 8 things and post these rules. A the end of your blogpost, you need to choose 8 friends to get tagged and list their name. Don’t forget to leave them a comment telling them they’re tagged and to read your blog. Okay... here are my 8 random facts. I'm not sure if I've told you any of these before or not. I can woof just like a puppy. It's because I'm an honorary husky. 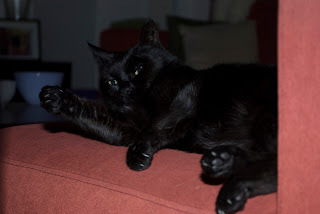 For a while, I liked to sleep in front of the TV so mum and dad started calling me telly show cat. I love to watch cricket on the telly. I watch the bowler's action and carefully watch the ball in the field. Adam Gilchrist was my favourite player, but he's retired now. If you touch my back paws, I will bite you. Just so you know. I have never gotten up on the dining table. I am a good girl. If there are maltesers in a bowl in our house, I will scoop one out with my paw and play with it. But I won't eat it. I have to sleep between mum and dad every night. If there is no room in the middle of the bed, I will stand on dad until someone moves for me. So those are my 8 random facts! I know I'm supposed to tag 8 other players but lots of pups and kitties have played this game already. If you haven't, consider yourself tagged! Did you all see my best friend Zimmie's post from Sunday? He demonstrated a new position to sleep in. This is my version. I don't have my head hidden like Zimmie did but I think my back paw pawsition is pretty close. What do you think? Ham. Of course this is the top of the list. Ham is my favourite snack ever. Everypup and everykitty should be allowed to have ham. Huffle House. This is where I sleep sometimes. I posted about it here recently. Helping. 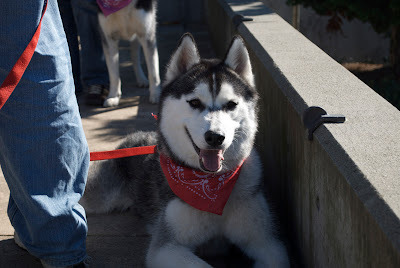 Because I am an honorary husky, I am part working breed. This is me helping mum to make the bed this weekend. Huskies. My best friend Zimmie is a husky. So are his two sisters and brother. Holidays. Recently I did a world tour to visit all my friends. Only, if your mum and dad are going on a holiday for FOUR weeks, that is not good. Holding up the walls. I make it look easy, don't I? Her Royal Highness, Queen Meeshka. She is our leader. And she is leading the fight against the evil squirrels. Huffle Duffles. Zimmie's mum makes really cool bags and she named one after me! I am getting a special purple and black one to hold all my mouses. Huffle Mouses. I LOVE to play with my mouses. Home. I love my home with my mum and dad and never want to leave. I can't think of a way to make MrSippi start with a H but I love him too! That's my list, pups and kitties! Let me know if you'd like me to send you a letter too. 1.Your mood right now... sleepy. It's my default setting. 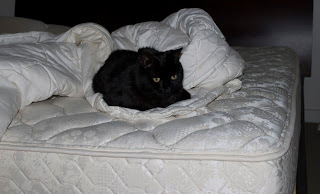 2.Your favorite spot in your house... Mum's bed (oh, it's dad's bed too). 3.Your favorite color... Purple. It goes very nicely with my black furs. 4.The one thing you can't live without... Ham. 5.Who do you love... my mum and dad. MrSippi, the most handsome boyfriendcat ever. 6.What would you do if you won the lottery... go and visit MrSippi, and my best friend Zimmie, and save some cats who need help. 8.Your favorite treat is .... HAM! 10. Your favorite music is... pop music - you can do zoomies really well! 12.Are you naughty or nice.... nice, unless you rub my belly. Then I will put the bitey on you. 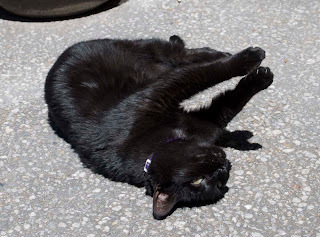 13.What's your favorite memory... when dad and mum rescued me from the cat shelter! 14. If you could go anywhere in the world where would you go.... to Kansas and Iowa. 15.If you could meet any celebrity who would it be..... All the pups from 8 Below. Anyone who wants to play, please do! Tell me when you've answered the questions so I can come and see your answers. Last Sunday I had a contest to see who could guess which of my paws was on display. 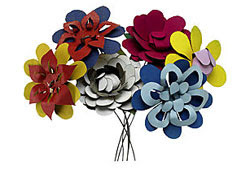 The first correct guess came from Sky Boy of the Kapp Pack, who gets awarded this lovely bunch of flowers. You can eat them if you want, Sky. They're probably tasty. Honourable mention goes to Angus Mhor, the OP Pack, my darling MrSippi and Mama and Carolina, Parker, Fin and Wilbur. Since you all guessed right, you can have the flowers too. Here, have a close up view of my whiskers. They are not very long compared to poo-face Salvador's. I'm busy napping this afternoon. It's a nice afternoon and I'm doing rollypollys out in the backyard between naps. My friends Gandalf and Grayson have discovered a most important tool in the fight against the evil squirrels. Look! 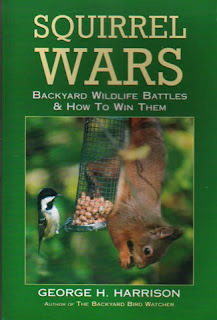 I think every HULA member should ask for a copy for their Christmas stocking, so we can escalate the war against the evil critters. On Tuesday, my friend Khyra gave this award to the SMS bloggers - that includes me because I am an honorary husky! Thanks Khyra! I would like to share this award with my friends Angus Mhor, Parker, Wilbur, Steve and Kat, and my lovely MrSippi, and Mama and Carolina. Although some of you may have already received it, now you're getting it from me too! My good friends the Kapp Pack have made a startling observation. In their local paper their mum found this photo! 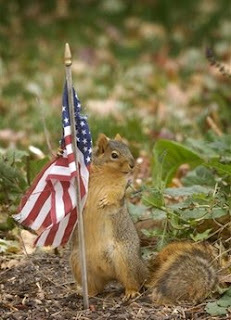 Can you believe the nerve of those squirrels? This means war. Queen Meeshka has issued a call to paws for all HULA members. We must be on high alert for these evil creatures and do our best to remove them from the planet. But as Meeshka notes, be careful. They may be armed. Today at the 11th hour of the 11th day of the 11th month, Australia commemorates the sacrifices of members of the armed forces and of civilians in times of war, specifically since the First World War. People wear poppies to remember the day. Since my grandpa fought in the Vietnam War, Remembrance Day has to be remembered. So speaking of remembering, about a million years ago Khyra gave me this cool award. Thanks Khyra! 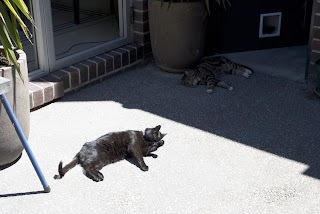 Yesterday it was very sunny and warm so I had to sleep in first, then go outside and lie in the sun for the afternoon. 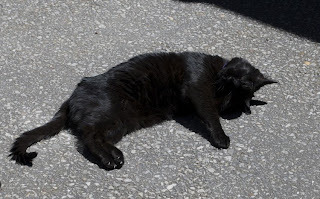 Even Salvador was outside with me, although he didn't lie in the sun. I don't know why, he is a bit mad sometimes. 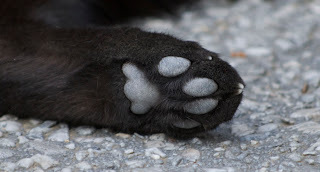 Which of my Huffle paws do you think this is? Remember a few days ago when I showed you all the lovely presents from Khyra and Wilbur, Steve and Kat? 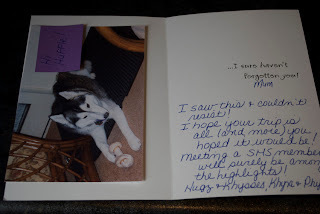 Well, Khyra and her mum also sent my mum a card but look! Doesn't it look just like me? Inside there was this message for my mum and dad from Khyra and her mum. 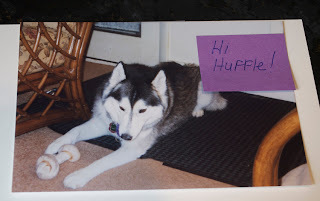 AND Khyra put in a picture of herself and a little note saying Hi Huffle! Isn't that nice? I need to get mum to buy me a frame so I can put my picture of Khyra in it. And the OTHER thing that Khyra put in for me was a little baggie of her fur! So now I can keep her smell with her photo to remind me of her all the time. It's furry khool, as Khyra would say. I was looking through all the photos from mum and dad's holiday and look what I found! It's a picture of my friend Steve, who lives with one of my best friends, Wilbur. He's pretty photogenic, isn't he? I'm not sure why there are no photos of Wilbur though. This is my Huffle House. When I first got here, I used to sleep in the Huffle House all the time. Then poo-face Salvador used to climb up and annoy me so I stopped. 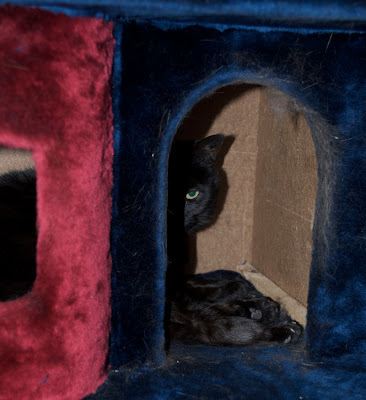 Now he's getting older and grumpier and leaves me alone so I can sleep in there again. It's part of the Cat Tree that dad got for us. You can see dad woke me up by taking this photo. I wasn't happy. I don't need to say anything today, do I? 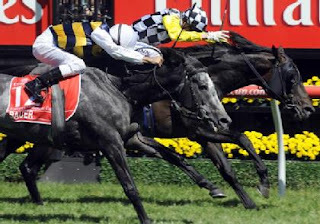 Today it's a public holiday in Melbourne to celebrate the Melbourne Cup. It's Australia's richest horse race, run over 3,200m. First place wins $3.2 million dollars. I don't think I can run fast enough to win though. Here is a picture of the horses that came first (Viewed) and second (Bauer). Viewed won by about 3cm. It was a very close finish! Mum didn't have to go to work today so we had coffee in bed. Then mum and dad went shopping and came home with boxes! I had to check them out, an explorer cat's work is never done. I'm going to have a nap now, like my best friend Zimmie is doing. If your parents ever go away and leave you alone for FOUR whole weeks, you must make them pay by acting really pathetic and getting lots of sympathy. Since mum and dad got home on Friday, I have been staying very close to mum. Everywhere she goes I follow her. If she sits down, I want to sit on her lap. If she's in the kitchen, I am under her feet. If she's looking in the fridge, I am sitting next to the door looking sad (and hoping to get ham). 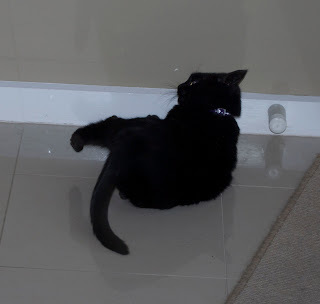 If mum goes into the bathroom, I try and follow. When she's in bed, I am right there next to her. So far it's working well. 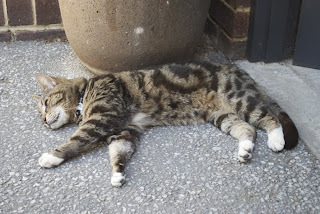 I am getting lots of pats and dad feels really sorry for me so he is being nice and letting me outside then inside then outside then inside and giving me some roast chicken from last night's dinner. They probably won't leave me alone like that again. While mum and dad were away almost forever, they met up with Steve and Kat and their mum and dad for lunch one day. Steve said mum and dad were well behaved so that was good. Wilbur, Steve, Kat and their mum and dad, and Khyra and her mum, sent along some presents for me! I have such nice friends. 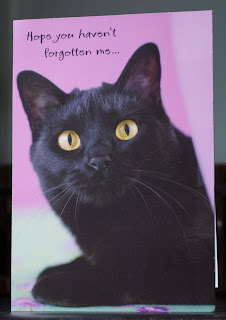 Khyra and her mum also sent my mum and dad a card with a picture on it of a cat who looks just like me! I'll show you a picture of that another day. I hope you enjoyed Turbo's debate against the Dyson Animal today too. The big debate is happening tomorrow! 7am Sunday my time, which is Saturday at 4pm Eastern time, 3pm Central time, 2pm Mountain time, 1pm Pacific time. That's 5:30pm in Newfoundland and Labrador. Turbo versus Dyson. Tune in and vote for your favourite!